This is a truly great paragraph taken from the book: The Rhythm of Life: Living Every Day with Passion and Purpose by Matthew Kelly. It rings true not simply in our own lives but can be even be extended to entire populations and civilizations. Statistically speaking this is true too. If you are surrounded by people who smoke, for example, the odds are that you will too. Taken further, if the only people you know are people with little passion or drive in their lives, then it will be more difficult for you to realize how much further you can push your life to go. On the flip side, when you surround yourself with people that are always driven to learn and explore, or take risks such as starting a new business, then almost subliminally you will be more inclined and motivated to also explore. But when looking at a more macro scale, in terms of entire civilizations, this concept of the people, and even environment around you significantly moulds who you are, rings true as well. A very grim but fitting example is during the slavery period in the United States, and even in other parts of the world. Slavery then was common place, and for many people that knew no other reality, it seemed almost like a simple part of what life entails. This shows just how powerful the people around us are in influencing what we do or value, especially given that slavery went on for hundreds of years, and only recently has it been abolished in the United States. Thus the people around us have a strong influence to either help build us up or build us down. So the important thing is to first question how much of your daily life, your acts, your thoughts are truly yours and not simply the same as the group or environment you are in. 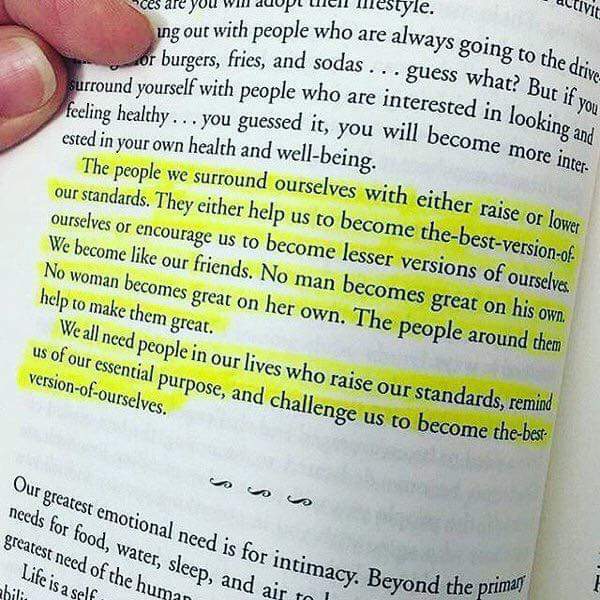 Realizing this then always ensure that you surround yourself with people that only help positively build your character. This in turn, will help build up the very people that let you a part of their lives.